I am in my element right now. 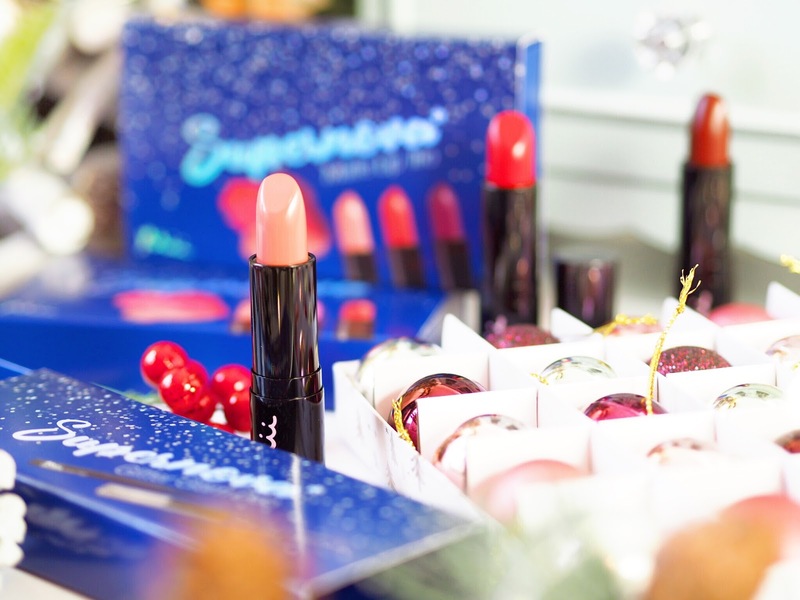 The amount of gorgeous Christmas collections on the market is making for a very happy Beauty Blogger – but also a slightly broke one! (Please tell me I’m not the only one who just can’t resist all these pretty, limited edition sets?!) Christmas is one of my favourite times of year anyway, I’ve always loved it. 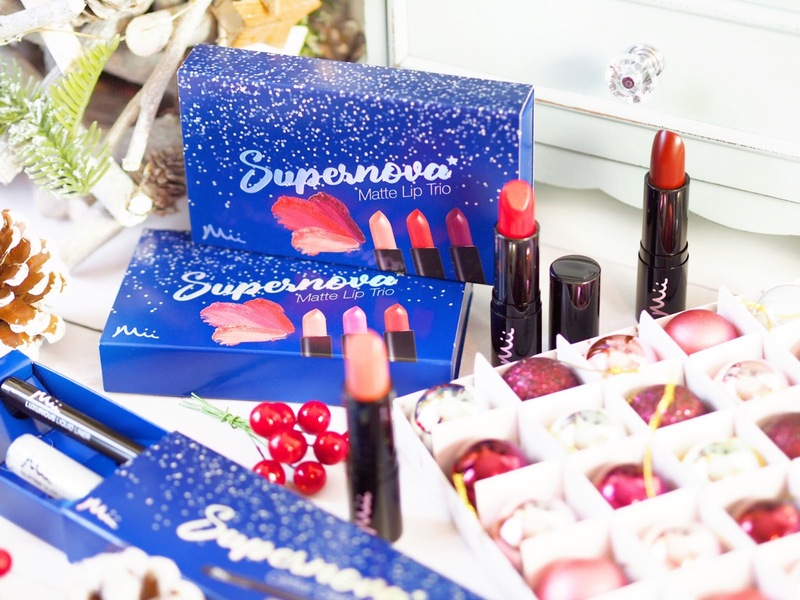 I love everything about the festive season – including the make-up and beauty sets that just can’t be beaten! One of my favourites, Mii Cosmetics, have released their range of Holiday Sets and they’re pretty darn impressive. 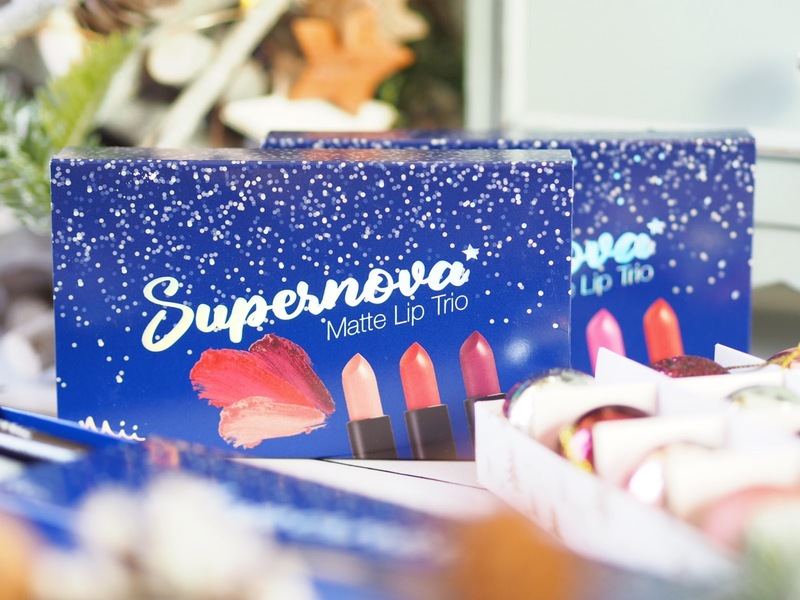 The Supernova range of Christmas sets includes three different varieties for lips and eyes and all three are pretty and well priced – meaning they’ll make great gifts – or treats for yourself. 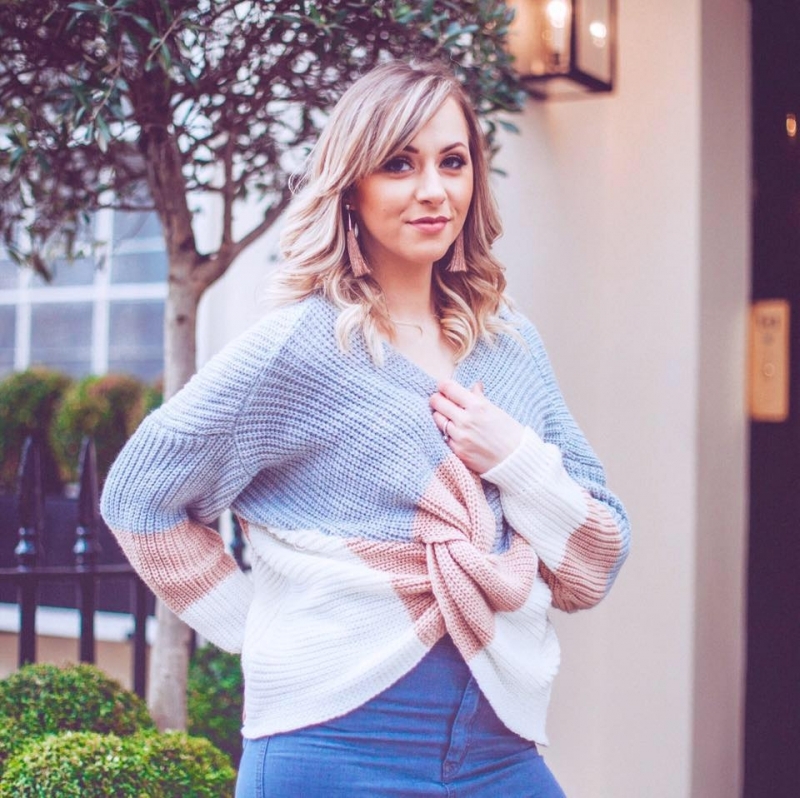 Mii Cosmetics have been a favourite of mine for well over a year now and I wish more people knew about them (I am on a one-woman mission to make sure everyone does!) 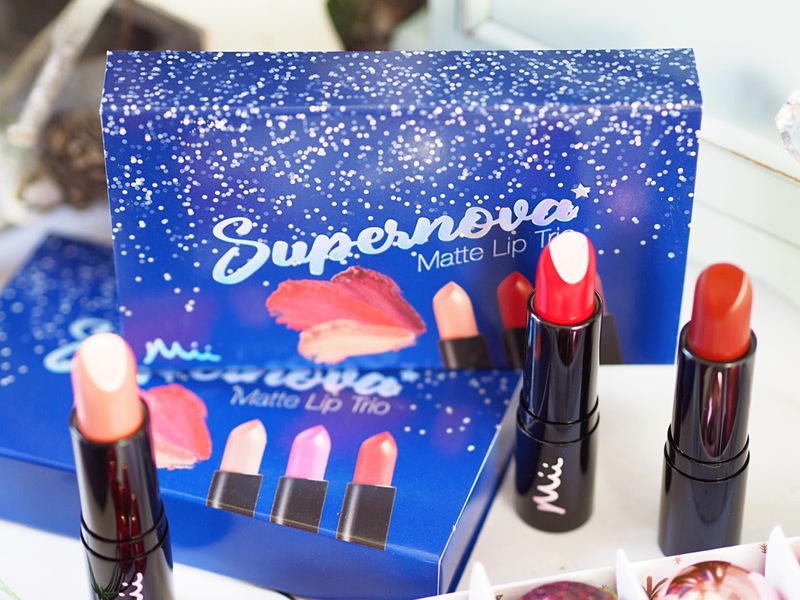 Their matte lipstick formula is one of the greats – non drying and they last really well too. So I was excited to see that the Christmas collection contained two different lipstick sets. Each shade is perfect for winter and party season, with the plum being a real stand-out shade. I also find that this set would be so versatile on any skin tone because the range of colours would suit anyone. As with all Mii lipsticks, these are weightless to wear and don’t weigh the lips down or feel drying. They’re smooth to apply and the colour payoff of all Mii lipsticks is really high. So these would be a great little treat. This collection of colours contains two of the same as the Vixen Trio, but with a gorgeous bright pink instead of the Adoration plum shade. The bright pink makes the trio pop with colour and it’s perfect for those Christmas parties and having some fun with your lip shades. As always, one sweep of the lipstick and your lips show deep colour payoff. 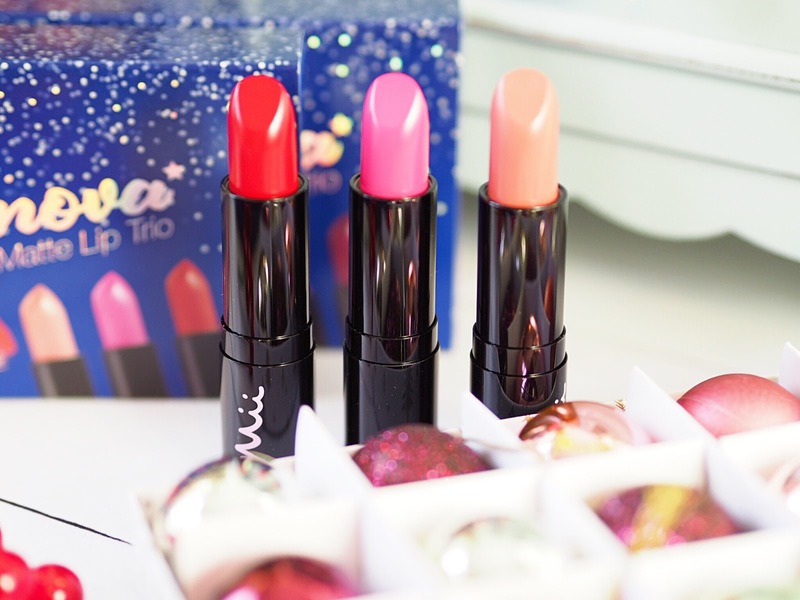 Both lip trios are £31. 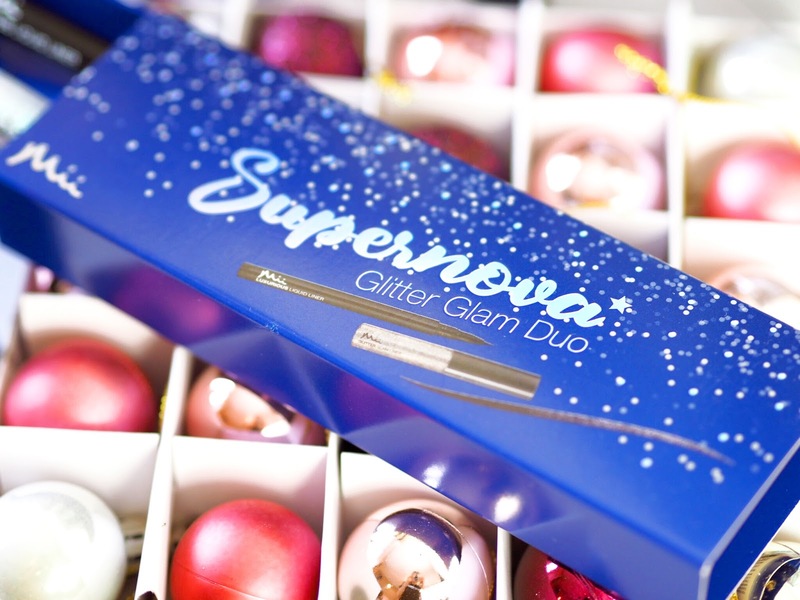 Also in the range of Supernova Gift Sets for Christmas, is the Glitter Glam Duo which is basically a staple for party season. Containing the Glitter Eye Liner that I raved about in my Autumn Favourites, this set also comes with a black liquid liner to help define the eyes as well as line them. These two together add sophistication and glitz and glamour all in one. And the duo is only £20 so it’s well worth investing in for some fun with your eye make-up this Christmas. Each three sets in the Mii Cosmetics Christmas collection are perfect little treats for this Christmas. 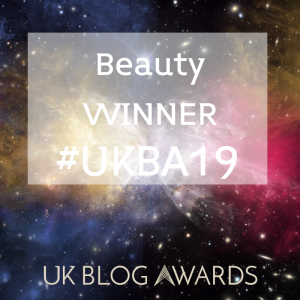 The packaging is cute and festive, the products inside are fun and easy to wear – so there really is no reason for make-up lovers not to adore them!